"Yung Eheads, nagbati na... tayo, hindi pa ba?" Would you like bat-tea, bat-coffee, or sala-bat? While trolling around the Internets, I found out that a friend of this blog (and my buddy Ivan's sister) is getting married. And not only that, she's having the ceremony in the (haunted) chapel at Paco Park. Reporter: "Batman, pwede ba kitang ma-interview?" Batman: "Sure. Magkita na lang tayo mamayang gabi sa PPC." Reporter: "PPC? Baka CCP, Cultural Center of the Philippines?" Batman: "Hinde, PPC--Paco Park Cemetery." 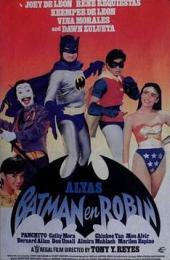 Now that was a great Batman movie, right up there with The Dark Knight. Rene Requiestas played The Joker. Panchito, whose character is usually named Tiyo Paeng in Joey de Leon movies, plays the penguin. But not just any penguin: in this one, he's Tiyo Paenguin. Swine flu outbreak in Pangasinan? While the whole world is on alert over the swine influenza outbreak in North America and New Zealand, the Manila Times seemingly has a scoop on their hands with a report stating that swine flu has already reached Pangasinan. The pig story is a little fishy (heh)--there's already a denial from the director of the Bureau of Animal Industry--but it would really bring a lot of comfort if one of the big news outlets went ahead and checked the story out. On Facebook, Howie Severino posted a picture of him interviewing Vilma Santos for a story he's doing for i-Witness. Vilma: "Miss, isang cheeseburger at isang fries." Counter Girl: "For takeout, ma'am?" No one expected that the ratings for this event would scratch Pacquiao fight levels; only big events such as the Marimar finale or Angel Locsin's first transformation into Darna ever get into that stratosphere. But the fight, despite numerous commercials and a dead timeslot, managed to draw about as much viewers as GMA's primetime programs, and more than either network's noontime shows. Put it this way: more people cared to watch Donaire and Viloria fight Raul Martinez and Ulises Solis than watch Gerald Anderson fight Jake Cuenca over Kim Chiu. Read the whole thing over at Fire Quinito. Had the best weekend stretch in a while. Thursday: Dinner with old friends at Bagoong Club. Friday: Will Ferrell night at Nomnomnom with Oli and Leks. Enjoyed this much more than grown men should be legally allowed to. Saturday: Frank and Ria's birthday dinner with high school buddies, at the new Eastwood mall. Sunday: Private pool swimming party in Calamba with officemates. The only drawback is that without my usual lazy weekend, I'm really dead tired right now... and it's only Monday! What about you, how was your weekend? I have a new blog that's all about sports, and it's up now. It's called Fire Quinito, and it's a different, fun look at Pinoy sports. I don't ask for much, even though a lot of you have been reading my blog for years now, so go there. Read it. Bookmark it. Subscribe to the RSS feed. Share it on Facebook. If you're not a sports fan, I'd still highly recommend taking a look at this post about Chris Tiu and Joseph Casio's brewing bromance. And there's this insane story about a star Fil-am basketball player that's all kinds of crazy. And if you're hooked, check out the ongoing primer on the amateur Philippine Basketball League, which contains, among other things, an anecdote about Melanie Marquez and a discussion of the state of generic drugs in the Philippines. PEP has the television ratings from the weekend, and the numbers say that the Eraserheads Live: The Final Set broadcast was a big winner. But first, a note about the ratings. PEP actually mis-reports the ratings (and have been doing so for two years now) by representing the ratings as percentages, but they are not; they are rating points. The difference is that rating points are absolute numbers; that is, a primetime program such as "Tayong Dalawa" that gets a rating of 20.0 has about the same amount viewers as a noontime show like "Eat Bulaga" that also gets a rating of 20.0. In the AGB Nielsen reports, there usually is another column for audience share, which is represented as a percentage. This indicates the percentage of the audience watching a particular program versus another program at the same timeslot. A few years back, I read somewhere that for AGB Nielsen's Mega Manila report, 1 rating point is equivalent to 30,000 households. I can't find any documentation anywhere though, so take that number with a grain of salt. But wait, these numbers don't tell us the whole story. Sharon and Ful Haus each run for only about thirty minutes, while the Heads concert ran for about two hours. The 21.1 rating, then, is an aggregate of the rating for the whole two hours. If you consider that there were probably a lot of viewers who dropped off during the latter part of the broadcast, it's a good bet that the first half hour or so of the concert was actually the most watched program on television last Sunday. So while the Heads concert did well, it only did about as well as a good episode of Eat Bulaga. But then again, the noontime slot has a built-in audience already, so of course many viewers will be tuning in. But how many viewers usually tune in during Sunday nights? The ratings have been pretty consistent, and the Heads represented a 50% increase in viewership in the time slot. First, it's a pretty good spot to take tourists. Forget the Rizal monument for a moment; Luneta has a beautiful rainforest-like orchid garden that too few people know about (along with Japanese and Chinese gardens elsewhere in the park), calesa rides, art-deco architecture in the vicinity, and the single prettiest thing Manila has to offer. Second, what was up with the "LOL" at the end of the post? What is so laughable about the idea about going to Luneta? Maybe I'm reading too much into it, but was it the prayer rallies at the Quirino grandstand? Or the old joke about maids and drivers going out on "day-off dates" in Luneta? Or the general un-hipness of the place? I probably should take all this with a grain of salt, and this was probably just a throwaway comment, but yeah, it kind of bothered me. Not least because it's just waay to easy to be a hipster douchebag these days.